An interesting conversation happened last week at the Waverly headquarters of NIT. A group of our clinicians was gathered together for our quarterly empowerment meetings when one of our marketing people asked if they would be willing to share a case study. These clinicians, who work with kids, adults, and seniors every day, helping each of them achieve their goals, work towards greater independence, mobility and function, were all silent. Each thought to themselves that they hadn’t done anything ‘extraordinary’ that week, they’d just ‘done their best’. To a clinician, perhaps their accomplishments were ordinary. But to the lay person, the family members, and the patients, what the clinicians do is truly a super power. 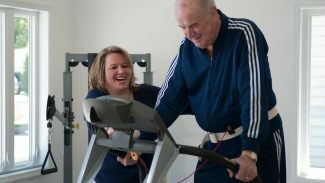 Lives are transformed every day through the work Physical Therapists and Physical Therapist Assistants do. Just ask the ‘ordinary’ people who have benefitted from their skills. If you ask a PT or a PTA, they’ll say ‘they did their best’. But to those of us who watch the magic that they perform every single day, they are, in fact, extraordinary. Our heartfelt thanks to all PTs and PTAs across the country for everything you do for all of us! PreviousPrevious post:Harnessing the Power of Technology to Stay in TouchNextNext post:Parkinson’s Disease – Do you know what to watch for?